Our team is comprised of ecologists, zoologists, wildlife biologists and carers in south east Queensland. Our dedicated staff have extensive experience in snake relocation and wildlife management, in both residential and in large industrial projects, up to and including the mining industry. We have a passion for conservation and work hard to provide you with the best snake catcher services and wildlife management solutions. SnakeOut Brisbane snake catchers provide affordable, fast and professional Brisbane snake removal and wildlife management services throughout Brisbane and all surrounding suburbs. Click on the boxes below to learn more about our Brisbane snake removal services. Our fees work on a call-out basis, starting at our standard snake removal call-out fee of $110*. This means we will arrive on site and do our best to remove the snake from your property. (**additional fees for weekends, out-of-hours calls from 6pm to 7am, for drive-times longer than 30 minutes, or public holidays). For more details, you can call us anytime for a free phone consultation on 0456 880 903. Please note, for the snake it be legally removed, it must present some kind of threat to pets, people, or property, rather than just being a nuisance. For instance, a non-venomous snake outdoors with no pets around does not present a threat, and should simply be viewed as an important and beautiful part of our local ecology. The success of any snake removal will depend on several factors. These include, but are not limited to; how long it took for the client contact us, whether the snake was disturbed, under a hide, or on the move, also the ongoing presence of pets/people, and most importantly..IS THERE SOMEONE OBSERVING THE SNAKE FROM A SAFE DISTANCE OF AT LEAT 5 METERS OR MORE? Additionally, snake removals rely on another rather uncontrollable factor; luck! The fact is, many snakes will simply be moving through your property during their seasonal searches for resources, and may just move on from your property after a short period. As such, if we can't find or access the snake for some reason following a charged callout, we can return to the property at half price for the next 24 hours if the snake is sighted again. We pride ourselves on providing our clients with a professionally carried out snake removal/consultation and property search, and the peace of mind of our half-price return period. Snakes are a natural part of our local ecosystems, in fact they are essential for ecosystem health and well being, including ours! While the various species of snakes might be adapted to a wide variety of prey items (such as the bizarre crab-eating mangrove snakes of genera Fordonia and Gerarda in the Homalopsidae family), many are fantastic rodent predators. Snakes have a massive impact on rodent control, in both urban and agricultural settings. This is particularly important here in Queensland, which has extremely high rates of rodent-borne diseases. All things considered, we looooove snakes! They protect us from rats and nasty diseases spreading in rodent urine and faecal matter throughout our suburbs and homes. They keep the balance between prey and other meso-predators, including other snakes, often being cannibalistic and thus perhaps less likely to reach dangerously high densities. They also provide a fantastic food source for many native predators, from various large lizards to kookaburras, eagles, and owls, as well as, of course, other snakes. We urge our clients to consider, before calling; Does this snake present a threat? Can it be safely left to move on by itself if pets/people are kept away? 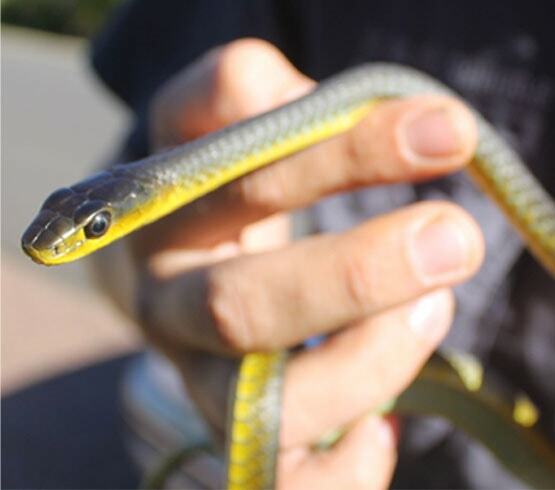 At Snake Out Brisbane Snake Removal and Wildlife Management Services, we value our native biodiversity. We also understand that translocation and removal of wildlife, particularly snakes, has been shown to be distressing for the animal in question, with the potential to significantly increase their mortality rates. As such, it is our professional duty, to both our clients and our native wildlife, that we do everything possible to minimise the stress caused during capture, handling, transport, and release, as well as providing an ecologically suitable release ground within the local ecosystem for each species of snake we encounter. While we don't recommend anyone handle or approach venomous snakes, we also believe that hook-and-tail capture and handling, without pinning or restraint, is one of the best methods available. As such, we are well trained in handling snakes using this method, with certified qualification in venomous snake handling and over twenty years experience with venomous snakes and other reptiles. Venomous snakes, in particular, are secured in specially designed hoop-bags with drawstrings and secured for transport in contained, lockable boxes with suitable airflow. Throughout the year, we aim to provide a stable temperature (not too hot, not too cold) for animals during transport, running our air-con constantly through summer! Following capture and containment, we use Google Maps or other navigation software to locate a suitable release habitat for each snake, drawing on many years of experience, as well as reading current literature on snake ecology, an ongoing pursuit (see our snake-science essays at SnakesOnTheBrainBlog.wordpress.com). Snakes are generally released somewhere quite, away from the general public. Aside from suitable local habitat features which are somewhat species dependent, all snakes need some immediate cover in which to flee, hopefully giving them some time to recover from their ordeal without further harassment from humans, noisy-miners and other mobbing birds, or predators, whether feral (such as cats and foxes) or native (like raptors, large monitor lizards, and other snakes). Though far from ideal, we hope these actions help translocated snakes settle back into the ecosystem, while constantly sharing with our clients the many benefits of snakes. DON'T SPOOK THE SNAKE! While their eyesight is terrible over more than 5-10 meters and their hearing is practically non-existent, approaching them will only make them more alert, flighty, and eventually, defensive. Stay at least 5-10 meters away and keep movement to a minimum if you intend to keep an eye on the animal. DO NOT try to catch, kill, or otherwise harm the animal, this only makes things more dangerous and is against the law. CAN YOU ID/PHOTOGRAPH THE SNAKE? What can you note about it's features, including size, body pattern and colour, location/behaviour (climbing, swimming, on the ground), head shape, or anything else? These features, and any clear photos you can manage without spooking the snake, can help you identify which of your local species you're looking at and will certainly help your snake-catcher to ID the animal. CALL A SNAKE CATHER! If you can't ID the species, if the snake is indoors, if there are pets or people at risk, you can immediately call a snake-catcher anytime for an over the phone consultation. This can help determine the next best course of action and get assistance to your door if necessary. MONITOR THE SNAKE! Let's say we've determined you have a venomous snake on your property. Now would be a bad time for a shop run. Stay and monitor not only the snake's location but also the movements and safety of your pets, family, and/or friends who may be present. Make sure they also do not spook or approach the animal while you wait for the snake catcher to arrive. TALK TO YOUR SNAKE CATCHER! They are likely to be a wealth of knowledge about snakes in your area and can help plan for future snake sightings on your property as necessary, whether you choose to have the snake removed or not. MINIMIZE RODENT HABITAT! Here in eastern Australia, the common or eastern brown snake (Pseudonaja textilis) causes the most dangerous snakebites and, being a rodent specialist as an adult, is drawn to the smell of rats and mice. This goes for many of our native snake species. Minimising rodents by reducing rubbish and litter piles, particularly around the home, as well as keeping tidy refuse bins, can help lower the chance of inviting a venomous visitor to stay. Where necessary, we recommend rodent trapping with human cage traps or snap-traps rather than poison baits, which might go on to poison native fauna from lizards to owls. Brown Snake in Electrical Shed with Brisbane Snake Catcher Janne Torkkola.